Stocksbridge PS Boss Chris Hilton (on right) happy to "get monkey off his back"
It will be a confident Stocksbridge Park Steels that welcome East Division leaders Morpeth Town to Bracken Moor. Steels ended their away drought by beating Pickering Town 2-0 last weekend to climb off the foot of the table and out of the bottom two. 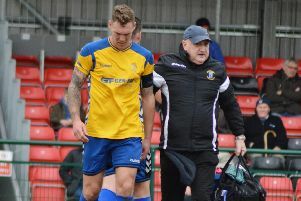 Stocksbridge have lost just one of the last five and manager Chris Hilton wants his side to keep the run going but accepts it will be a tough task. “For me, they’re the best side in the division so of course we know it's going to be a tough game,”.said Hilton. “We want to try and go another game unbeaten. We’re unbeaten in three and have won two and drawn two of the last five games and kept three clean-sheets so it’s been pleasing since the turn of the year. “Our home record is decent so we’ll try and get at them if we can. But it’s important though we stay in the game, then you’ve always got a chance. We’ve tightened up at the back and started to look very solid it’s just at the other end where we’ve not scored as many goals as we would have liked, although we’ve been creating chances. We just need to start turning more of our chances into goals. 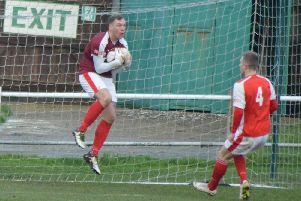 Hilton was equally delighted and relieved with the win at Pickering and said: “It was good to get the first away win and get the monkey off our back. Hilton is set to bring in a goalkeeper on loan to cover for the injured Hall, while Luke Mangham is ruled out after picking up a knock against Pickering. Tom Charlesworth is doubtful with the defender struggling with a back injury. Gavin Smith’s side comfortable beat Pickering 5-1 at Mill Lane the just before Christmas and will be confident of completing a league double over a side that have picked up just one point from the last three outings. “We’ll look to carry on doing what we have been doing, moving the ball quickly get it into the box and we’ll create chances” said Smith. Frickley Athletic entertain play off chasing Stamford as they look to extend their unbeaten run to five games since the turn of the year. Premier Division: Buxton v Stalybridge Celtic, Matlock Town v Nantwich Town. East Division: Frickley Athletic v Stamford, Sheffield FC v Pickering Town, Stocksbridge PS v Morpeth Town. .